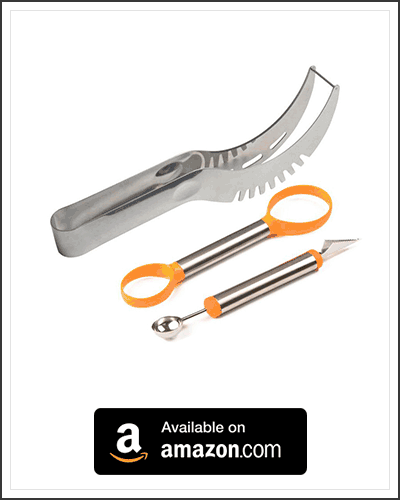 The Best Watermelon Slicers for 2019 - What About Watermelon? Getting that perfect slice of watermelon is as simple as pie. 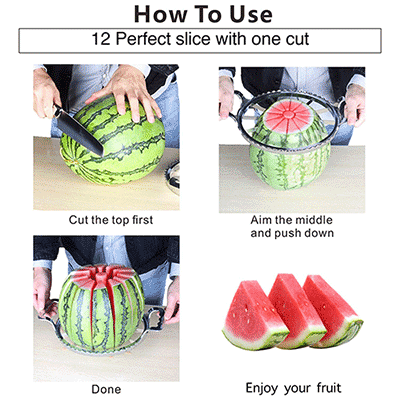 If you are not comfortable with using a knife to carve up your melon, or if you are looking for a quick and easy way to get that perfect slice, then this is the article for you. In many households all across the world, one of the best ways to cool off on a hot summers day, is by enjoying a sweet and tasty slice of melon. 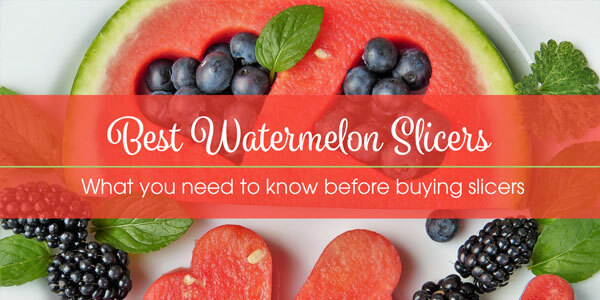 Both kids and adults alike, really enjoy these juicy treats, but trying to slice up a melon can be risky, especially if you are not using the right type of knife. This means that many kids miss out on cutting up their own slices, instead having to wait for their parents or guardians to do it for them. With these slicers, your kids can help out when preparing these delicious treats (under supervision of cause), not to mention, making it more efficient and less time consuming when you are getting snacks and salads ready. 1.2 Is the Design Child Friendly? Before you go out and buy yourself a new slicer, there are a few things that you need to take into consideration. Just like with any other kitchen utensil, there are pros and cons to using different designs. 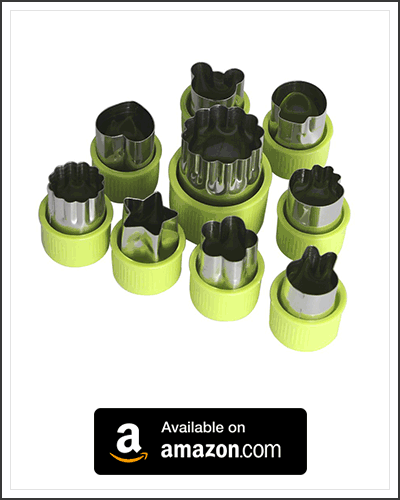 From size to shape and function, each of these slicers may be more suitable for different people or different applications. Aside from the traditional blade carvers, aka knives, there are also many options that can slice through the watermelon’s soft flesh, but they may have hard time piercing its outer skin. Then again some slicers could potentially pierce the rind with ease, but be so flexible that they can’t provide a straight cut, instead bending and twisting under the pressure. For this reason it is very important to make sure that the slices design suits your intended use. For the best results, you may be better off using multiple utensils, one to break through the rind and cut the melon into manageable pieces, and another one to slice up the flesh. Also take into consideration, your own comfort and its ease of use. One of the best designs on the market, does require some degree of strength and height in order to be able to use it effectively. Similarly if there is no comfortable grip for you to hold while slicing up your melon, your hand could get tired fairly quickly. So make sure to choose a design that suits your own capabilities, and provides the adequate comfort needed for your intended use. Is the Design Child Friendly? If you would like to let your children help out with preparing the watermelon slices, you may need to ensure that the slicer is safe for kids to use. This is not to say that there are no slicers out there that are safe for kids to use, nor are we saying that all slices are safe for little hands. Many slicers have been designed with child safety in mind. Some models have rounded teeth or their tips are blunt, to help prevent any nasty cuts. Others have been designed to be the best at slicing through the melon’s rind, making them very sharp. One of the best ways to make sure that a slicer is safe for kids to use, is find one that does not require the child to place their fingers under the blade at any point. One of the most common cases of injuries when slicing up melons, is when someone has their fingers under the blade as it reaches the cutting board or bench. The models that we are showing you today, are relatively safe for kids to use. Keep in mind that a dull or blunt blade is more dangerous then a sharp blade, as a blunt blade could slip off the melon, or cause the rind the crack sending the blade off course. Remember to always keep an eye on your children when they are using melon slices. 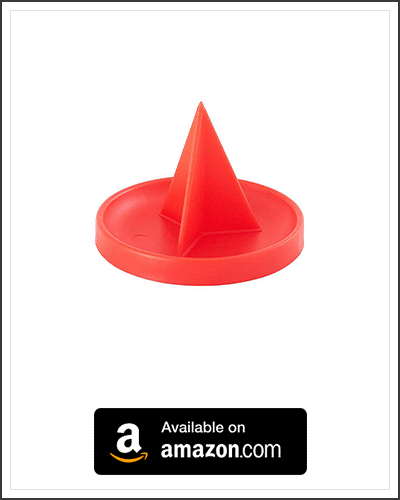 This simplistic and very nifty little device helps to stop the melon from rolling around. By spiking your melon onto the slicer stand, it allows you to free up a hand as you slice away. 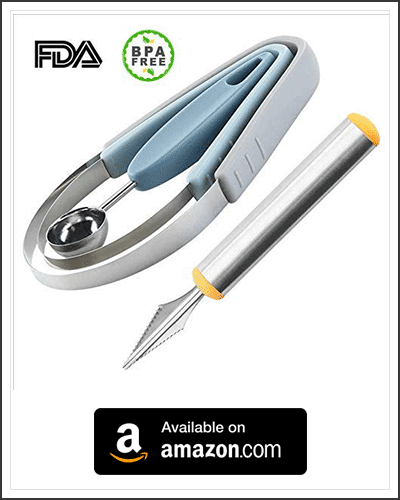 Using a utensil like this can be safer than having to try and keep the melon stable with your other hand, as you are less likely to slip and cut yourself. For optimum use, place your free hand on top of the watermelon to help stabilize it even further. 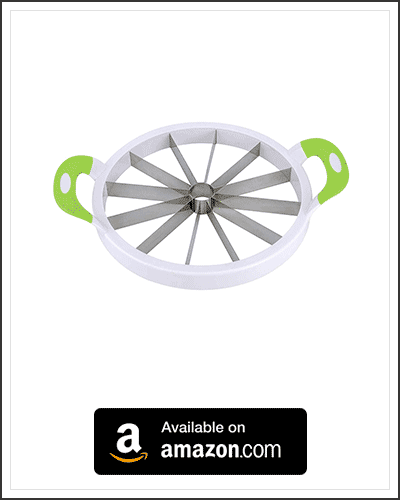 One of the best melon slicer designs that is available on the market to date. This contraption slices up the whole melon in one motion, giving you multiple triangular segments, that you can further divide. 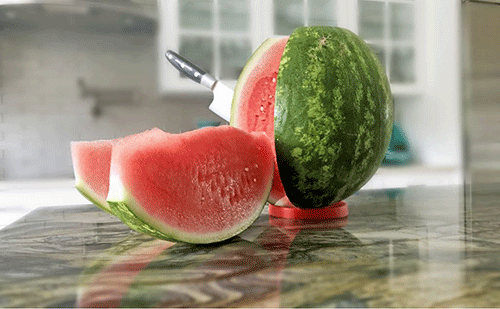 The core ring removes a column shaped segment from the center of the watermelon. Which means that this slicer can be used on other melons and fruits, as long as they fit withing its diameter. If you were to use these slicers on other fruits such as apples, or pineapples, it will remove their core at the same time. The biggest draw back to using one of these, is that they do require some upper body strength. As all of the blades will be slicing through the rind, there will be some resistance. With proper leverage and posture and a little bit of practice, even those with little upper body strength, will be able to use these slicers with relative ease. To begin, check that the blades are not overly dull, sharper blades will make the process easier. Start by remove the top of the melon. This will provide less resistance for the blades to pass through. 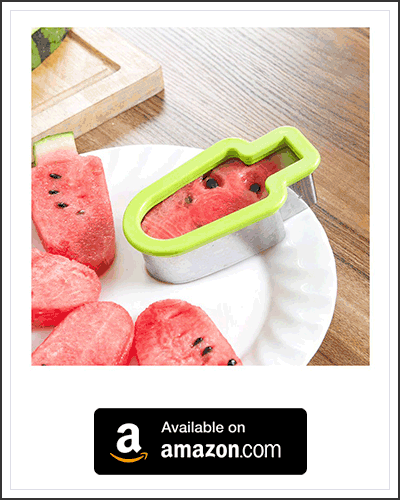 Either use the slicer stand mentioned above, or cut a flat spot into the base of the melon. A stable melon will make it much easier to cut through. Placing the slice on top of the melon, push down with equal force on both handles until you have cut all the way through. Applying more force on one side then the other, will cause the melon to fall over, or you will start to turn into the cut and may jam up. Remove the segments and either slice them up into small triangles, or serve as is. Just as the name suggests, these are tong like slicers. There is a small slicing blade located at the tip of the tongs. By turning the tongs upside down, and running the blade along the inside edge of the melon, you are able to both slice out a segment and separate it from the rind. Once a full slice has been made, the tong like design can be used to remove the segment from the rest of the water melon in one clean piece. 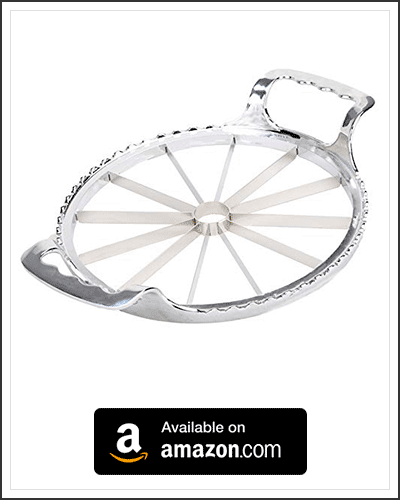 A slicer like this is great to help kids improve their hand and eye coordination. With a little practice, cleanly cut full sized pieces and be easily removed from the rind, leaving behind very little flesh. Arguably one of the best slicers for kids to start learning on. 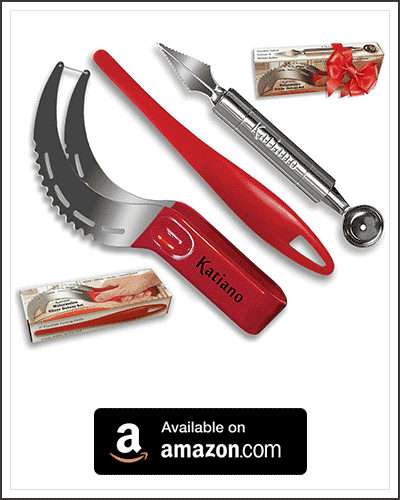 The slicers, sculptors and melon ballers found in this sort of kit do not have any sharp edges. They are designed to slice through the soft flesh of the watermelons and other melons such are honeydews and cantaloupe. Simply give them a slice of melon with the rind still attached and they can start practicing by removing the delicious flesh. Alternatively, give them a melon that has been halved and watch as they try to turn the rind into a bowl for you, by cutting out slices or making melon balls for you. Eating watermelon that has been cut up into bite sized cubes is a much more “civilized” and convenient method to eating melons. Party guest and family members would much rather be eating their watermelon with a fork or toothpick, rather then have to hold onto a large slice and eat around the rind, while trying to be sociable. Most of us would only consider slicing the melon up into cubes, or using a melon baller to make balls for people to eat. But why stop at only cubes and balls? Have you ever considered cutting the watermelon into different shapes instead? There are many options on the market for reshaping your watermelons these days. From basic shapes, to love hearts and cars. Almost any shaped stencil cutout can be found. 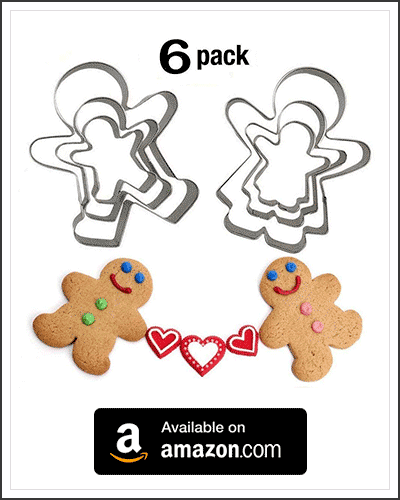 Basically, if there is a cookie cutout in a set shape, then there is the same shape available for your melons. Here are a couple of examples that you could use to make attractive decorations out of your melon, or even fun and unique looking Popsicles that could be just as easily placed in the freezer for a cool looking frozen treat. To cut out these shapes, simply cut the melon into the desired thickness, and press the stencil cutout into the flesh, and presto, uniquely shaped melon bites. Not everyone can eat candy on Halloween, this is where watermelons can save the day. Not only can they be used to make a tasty substitute for the sugar filled treats, they can also double up as serving platters and jack-o-lanterns. With the right tools, we are able to carve out the rind and make decorative bowls and scary/fun looking alternatives to the humble pumpkin jack-o-lantern. By using the above mentioned slicers, ballers and stencil cutouts, you can make some pretty impressive looking decorations. 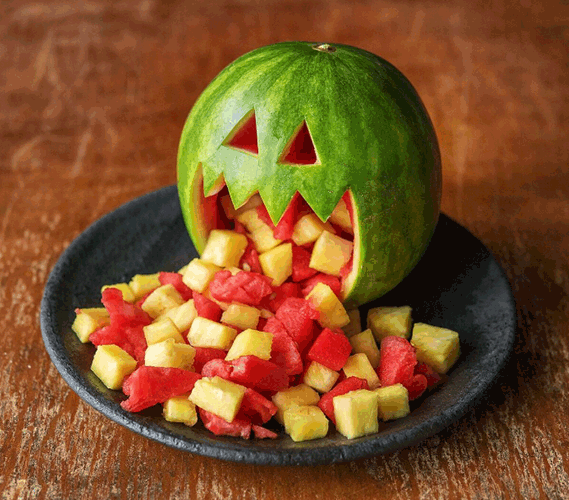 In truth, the tools that can be used to carve out pumpkins, can also be used to carve out a watermelon to achieve similar results. 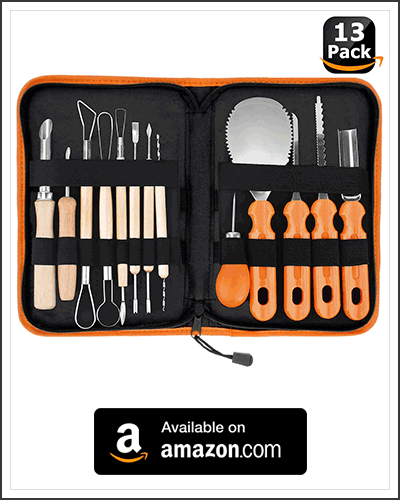 Here is a full carving/sculpting kit that we would recommend for any new carver to get started with. 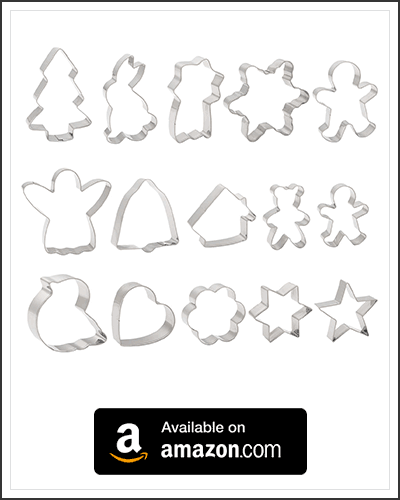 For those of us who enjoy Christmas and would want to use some Christmas themed shapes and cutouts for their watermelon bites, there is always the option to use Christmas themed cookie cutters to achieve this. 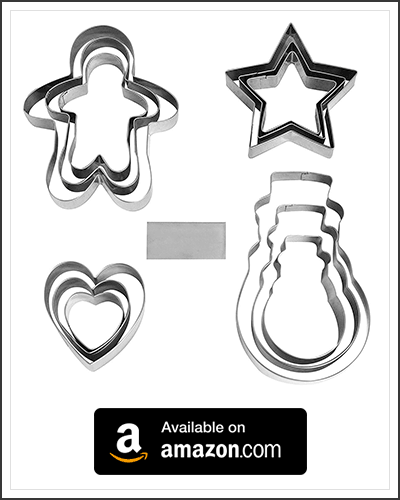 One thing to keep in mind however, is that a cookie cutter tends to be shallower than the type of cutters that are used cut the shapes out of fruits and vegetables. One work around for this is to cut your water melon no thicker then the cookie cutter itself, and to only use cutters that have no lips or edging on the top. 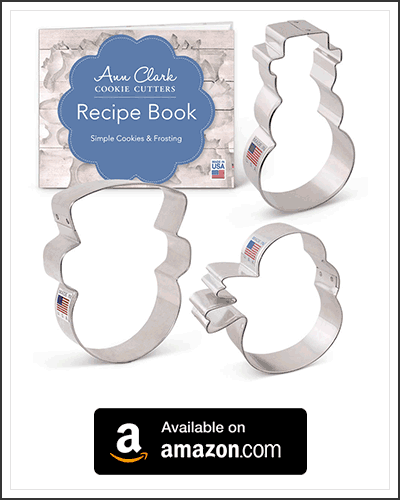 This will enable you to push the watermelon right through the cookie cutter, lowering the risk of the melon breaking apart as you try to remove it. Another thing to watch out for is the fine detailed edging. If there is a small opening or partners that could cause the melon to become stuck, then the risk of breakage is much higher. Look for open smooth designs that have limited detailing such as big antlered reindeer, curvy snowman and large snowflakes.